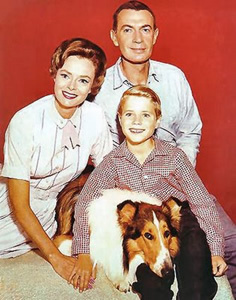 Performers include: Lassie, Jon Provost, June Lockhart, Hugh Reilly, Jan Clayton, Tommy Rettig, George Cleveland, Joey D. Vieira, Robert Bray, George Chandler, Arthur Space, Jon Shepodd, Cloris Leachman, Andy Clyde, Todd Ferrell, Robert Foulk, Florence Lake, Richard Garland, Jed Allan, Carla Balenda, Lloyd Nelson, Ray Teal, Kelly Junge Jr., Pamelyn Ferdin, Paul Maxey, House Peters Jr., Stuart Randall, Linda Wrather, and Larry Wilcox. After starring in short stories, novels, and movies, Eric Knight’s fictional collie came to series television. Lassie is a very intelligent dog who often saves the day through showing bravery and loyalty to those she loves. As the show begins, brave and loyal Lassie lives on a small farm in Calverton. She is owned by young Jeff Miller (Tommy Rettig) who lives with his widowed mother, Ellen (Jan Clayton), and grandfather (George Cleveland). A runaway orphan named Timmy (Jon Provost) is found by Lassie and soon becomes part of the Miller clan as well. When Gramps dies unexpectedly, Ellen realizes that they can’t work the farm alone decides to sell it and move to the city. Knowing that Lassie won’t be happy off the farm, Jeff gives his dog to Timmy. Lassie and Timmy stay behind and are cared for by the farm’s new owners, Paul and Ruth Martin (Cloris Leachman and Jon Shepodd, later June Lockhart and Hugh Reilly). Boy and dog sometimes share their adventures with friend Ralph “Boomer” Bates (Todd Ferrell) and his dog Mike. Did you watch Lassie as a kid? No, but wish I had! After many years, the Martins move to Australia but must leave Lassie behind due to animal quarantine regulations. She is initially left in the care of elderly farmer Cully Wilson (Andy Clyde) but he soon suffers a debilitating heart attack. Lassie then finds a place with Ranger Corey Stuart (Robert Bray) and ends up facing a number of new adventures in different parts of the country. When Corey is hurt in a forest fire, he assigns fellow rangers Bob Erickson (Jack De Mave) and Scott Turner (Jed Allan) to watch over her. Eventually, Lassie ends up without any human companions for awhile and wanders the countryside, finding new people and animals to help. She eventually finds a new home at the Holden Ranch in Solvang, California. Garth Holden (Ron Hayes) runs the place with the help of his two sons, teen Ron (Skip Burton) and Mike (Joshua Albee), and Ron’s friend Dale Mitchell (Larry Wilcox). When Garth leaves to set up another ranch, his brother Keith (Larry Pennell) arrives to watch over his nephews. Lucy Baker (Pamelyn Ferdin), a deaf child, and veterinarian Sue Lambert (Sherry Boucher) round out Lassie’s new group of friends. Lassie tracks down a stray calf and protects it from predators. First aired: March 24, 1973. Provost had a recurring role in The New Lassie series which ran for two seasons in first-run syndication. He plays Uncle Steve McCullough, a real estate agent. In the seventh episode, it was revealed that Steve was actually a grown-up Timmy. It seems that the Martins hadn’t actually adopted Timmy and he also had to stay behind when the couple moved to Australia. He was adopted by the McCullough family and began using his middle name, Steve. Lockhart appeared in the same episode, playing Ruth Chadwick who had remarried after Paul Martin’s death. She returned to find the dog she’d lost, claiming that there’d always been a Lassie in the family. She ends up finding her one-time son as well. Though the reunion’s a nice idea, this episode of New Lassie disregards much of the history established in the original series. After all, Lassie had been given to Timmy (not Ruth) and it seems inconceivable that the Martins would simply abandon Timmy after seven years. In another episode of New Lassie, Rettig returns as an adult version of Jeff Miller. He’s now a scientist that wants to test Lassie’s intelligence. A flashback of Timmy and Jeff was used in the episode. • The series ran for 17 seasons before being cancelled by CBS. It continued for two more years in first-run syndication. • Rettig and Clayton left the show because elderly Cleveland had died unexpectedly in real life. • Leachman was not happy in her role in the series and asked to be replaced as “Ruth Martin.” Unfortunately, the producers felt they needed to replace her on-screen husband at the same time and Shepodd was out of a job as well. • In 2007, Provost co-wrote his autobiography with his wife Laurie Jacobson. It’s titled Timmy’s in the Well: The Jon Provost Story . Though Timmy had many accidents over the years, Provost says he never actually fell down a well. Actually, the only main character on the series to fall down a well was Lassie herself in a season 17 episode! • On his website, Provost says that he kept in touch with Rettig until his death in 1996. He always ended their conversations with “Thanks for the dog, Jeff.” which was Timmy’s last line to Jeff in the TV series. I watched Lassie and am Binge watching it now and am in season 11 i am enjoying it now at 65 as much if not moire than when i was a child. My only disappointment was in season 7 the 3 or 4 episodes of where the martins went on vacation and Lassie and Corey met they were not a part of it. I just tpday ordered Jon Provost book Timmys in the well should be here tomorrow anxious to start reading it. The good old days!!! Oh how I miss them…. When Lassie came to live at the Holden Ranch, in this story it said Lucy Baker a blind child. Lucy wasn’t blind, She was deaf. When I first saw lassie it was when jeff’s collie was on the air. I loved Jan clayton and all the cast . The next time I saw it because of religious reasons we didn’t have a tv for a while ,Timmy was there. Then I saw a few episode of when the forest ranger had her. Then I saw a few when timmy was with his new family. I wondered if the story could pick up where it left off or is it possible. It has been so long. Please bring lassie back on tv it was my favorite show of all iam very disappointed it was on every day at 7:00 to 8:00 take lucy off and bring back lassie!!! You can catch it on FETV if you have cable or satellite (we have Directv, channel 323). Or watch on Youtube. I believe all the the episodes are there from the very beginning. As a 50’s kid, I watched Lassie faithfully. I’m so glad that with all the character changes, the producers decided to keep Timmy. He was perfect for the part! The article, above, forgot to mention 2 important characters that helped make the Lassie saga – Porky (Joey D. Vieira) and his dog Pokey, Jeff and Lassie’s best friends. The stories wouldn’t have been the same without them! Trully a family show. I recommend that today’s young people watch and learn the values of love and loyalty.